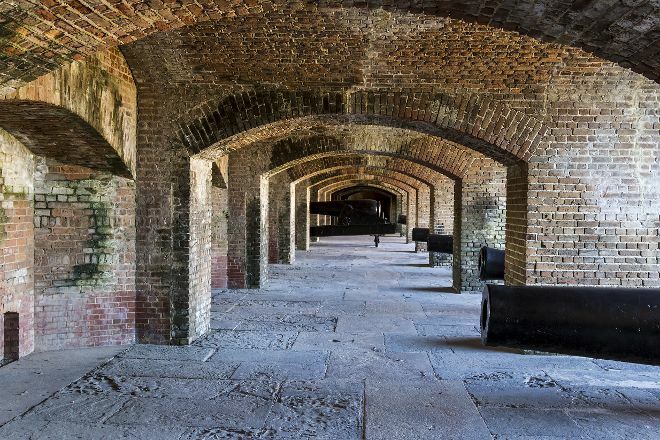 Offering a mix of history and recreation, Fort Zachary Taylor centers on a military fort from the Civil War era. Construction began in 1845 and lasted nearly 20 years. The fort played an important role in a network of military garrisons located along the southeastern coast. Deactivated in the 1940s, the fort contains the largest collection of Civil War cannons in the country. Take a short tour of the military establishment, and then spend time swimming, snorkeling, or scuba diving on the sandy beach. To escape tourist crowds near the fort, hike or cycle the natural trails crisscrossing the park. Add Fort Zachary Taylor and other attractions to your Key West trip itinerary using our Key West trip planner. Well preserved history. Worth the visit to this Fort. A lot of history. Strongly recommend. Beautiful landscapes that will render good pictures. The fort is interesting to see, but it Is a quick walk through. I have seen better forts that have been restored and or preserved. When I visited, there were no tour options available to give us detailed accounts of the history behind this fort, which probably would have made it more memorable. The park does provide a small pamphlet before you enter the fort, but it has little information beyond the simple dates of the fort being erected and the excavation process used to find the cannons buried at the top of the fort. There is a beach nearby, but make sure you wear water shoes since there is no sand only large rounded pebbles and some jagged rocks. Okay so this place is the absolute best spot we could find in Key West for the beach. It has amazing water that is clear the beach is solid unlike most down here and the snorkeling is amazing!! On top of that there is an incredible amount of sea life to see and natural bedding that is just astounding. There is also a place purchase food and rentals if you go during the day. A few things I will say though is there is a sharp drop off there so if you have young children you must be attentive, I would also recommend water shoes because of the bed rock and bring some cash it is 2 bucks a person but well worth the money spent!! Hands down a must visit in Key West!! Get there early, go to the very end and grab a picnic table in the shade to the left! This is the best spot as it's not full of rocks. Beautiful beach but very inaccessible in places. We stopped near the restrooms and made our way to the beach there. It was extremely rocky and not what we thought. You can rent chairs, I advise taking your own and leaving valuables in the car. Signs say no alcohol but the food hut sells beer. Aside from the rocks I snorkeled all afternoon. Lots to see, I could have stayed all day! Hub is not a beach person. We were cruise passengers that walked from Mallory Square. Easy 15 minute walk. There is a cost to get into the park. The beach was had lots of shells... We had read other reviews so we brought water socks... Worked out great. We rented snorkel equipment at their concessions. Our kids snorkeled and saw some fish, they thought it was cool. The park did have a snack bar, but lines were very long do we did not get anything. There are Lots of shaded picnic tables. The park has outside showers to rinse off and a bathroom... But no showers inside the bathrooms. It was a great inexpensive day for cruise passengers. Every day, we help thousands of travelers plan great vacations. Here are some tips on how to use your Listing Page to attract more travelers to your business - Fort Zachary Taylor. Promote your permanent link - https://www.inspirock.com/united-states/key-west/fort-zachary-taylor-a33958537 - on your website, your blog, and social media. When a traveler builds a plan from this page, the itinerary automatically includes Fort Zachary Taylor. This is a great way for travelers looking for a great vacation in your city or country to also experience Fort Zachary Taylor. Promoting your link also lets your audience know that you are featured on a rapidly growing travel site. In addition, the more this page is used, the more we will promote Fort Zachary Taylor to other Inspirock users. For best results, use the customized Trip Planning Widget for Fort Zachary Taylor on your website. It has all the advantages mentioned above, plus users to your site can conveniently access it directly on your site. Visitors to your site will appreciate you offering them help with planning their vacation. Setting this up takes just a few minutes - Click here for instructions.